Testosterone Depression! How low T can cause depression in men. Low testosterone and depression appear to go hand in hand for many men. 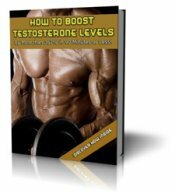 If you are suffering through bouts of psychological depression, a little boost in your free testosterone levels may be all you need to beat this problem. This is especially true if you score highly on the beck depression scale, or have symptoms that do not respond well to conventional treatment. Here's a short breakdown of a few testosterone depression studies you might find interesting. In a recent study with 203 participants, about 5% met the criteria for depression. The men who were depressed had significantly lower total and free testosterone levels compared to the men who were not. In another study, 278 men over the age of 45, who had no symptoms of depression prior to this period, were followed for two years. During that time, those with the lowest T levels were four times more likely to be diagonosed with clinical depression. This study was done in Australia with about 4,000 men over the age of 70. What the researchers found was, those with lowest free testosterone were three times more likely to be depressed than those with the most. Women are more likely to be depressed than men up until the age of 65. After 65, the difference between the two genders disappears. Research on animals has shown that removal of their gonads blocked the action of anti-depressants on key mood-controlling chemicals in the brain. 1940s, experiments showed that major depression could be relieved by injecting testosterone into men with low levels. The treatment never caught on because antidepressant drugs started to become available. In any given year, 8 percent of American men over 30 years old will experience an episode of major depression. Only a small percentage of these men will get significant help from popular antidepressants. I think the take home message is, if you're suffering from depression, avoid antidepressant medications, and other drug therapies.